Signs of spring are everywhere, but the "peep, peep, peep" of the spring peepers (Pseudacris crucifer) is what truly heralds its coming. These quarter-sized frogs are members in the Anura order of amphibians comprising the frogs, toads, and tree frogs, all of which lack a tail in the adult stage and have long hind limbs often suited to leaping and swimming. Spring peepers come in shades of brown, gray, or olive, and occasionally towards yellow or reddish. Its underside is cream or white, and it is patterned with a dark cross on its back and dark bands on its legs. A spring peeper's feet are moderately webbed with noticeable disks on its fingers and toes. And although it is a good climber, it seems to prefer the relative safety of the ground in amongst leaf litter. Late-winter blooming plants also provide good buildup to the coming spring. Walking my jungle the first day of March revealed a number of plants in bloom including hellebores (Helleborus), winter aconite (Eranthus spp. ), Fragrant Dawn Viburnum (V. bodnantense), Crocus, Witch Hazel (Hamamelis spp. ), and Hazelnut (Corylus spp.). Flowers can be absolutely fascinating…the color, the scent and most especially the structure. Take for example the American Filbert (Corylus americana). Being monecious, male and female flowers are borne on the same plant. The very visible male catkins appear in the fall and open in the spring, becoming more yellow as pollen develops and is released. The female flowers are so inconspicuous, they are easily missed unless looking for them specifically. That's because only the stigma and styles protrude just enough to collect pollen from a bud scale on the tip of a shoot, appearing as thin red threads. If you remember your witch hazels, the eastern witch hazel (Hamamelis virginiana) blooms in the fall and all the rest (H. mollis, H. vernalis and H. x intermedia) start blooming in mid- to late-winter. Many selections, most especially the vernal witch hazels (H. vernalis) bloom while retaining leaves (marcescent), while others drops their leaves and allow their spidery blooms to take center stage. Look closely and you will see that each sweetly scented flower sports four narrow, crinkled, strap-like petals that en masse creates a beautiful ray of color. This is the time of year when time can get away from you in terms of establishing an early vegetable garden. Let's assume April 20th as the date to reference for the last average frost date for the St Louis Metro-east. That means roughly the 2nd and 3rd full week of March (4-6 weeks before the last average frost date) is the window to transplant outdoors very hardy vegetables like asparagus (crown), broccoli, Brussels sprouts, cabbage, horseradish ("set" root), onion (set or plant), parsley, Irish potato (tuber "seed" piece), and rhubarb (crown piece). Unless you seeded these transplants in early February, store-bought transplants are your best option for such a short turnaround. Don't forget you can also direct seed a number of cool season crops in this window as well, including kale, kohlrabi, leaf lettuce, onion, pea, rutabaga, salsify, spinach and turnip. Keep in mind that onions cultivars differ in their bulbing potential in response to light duration. For our region, select long-day or day-neutral types if your goal is large bulbs. Short-day types are more suitable in this region for green onions. The frost hardy vegetables are planted outdoors next (2-3 weeks before the last average frost date), either transplanted or seeded in the garden. 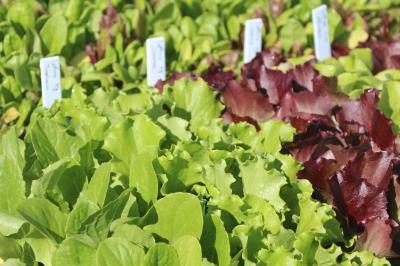 Like the hardy vegetables, there is not time to grow your own transplants to a sufficient size if you want to hit the optimal window, so store-bought is the next best option. Seeded frost hardy vegetables include beet, carrot, Swiss chard, mustard, parsnip and radish. Transplanted frost hardy vegetables include Chinese cabbage and cauliflower. You do still have time though to start transplants for the warmer season vegetable crops. Tomatoes can usually be transplanted outdoors without protection any time after the last average frost date. Tomato transplants should be started no later than the 3rd full week of March to give a full 4-6 weeks for transplant growth. Transplants for peppers and eggplant should be started a week later.